Maybe you think the market has topped out... that the bull market is over and stock prices are headed much, much lower. Or maybe you believe the market is entering a "Melt Up" phase, with new all-time highs just around the corner. Chances are, you have a gut feeling one way or the other. And that's a good thing. As a trader or investor, you should have opinions – even strong ones – that are supported by evidence. Otherwise, you'll never find the courage to put your money to work. But sophisticated traders know that once you exchange your cash for shares, your opinions don't matter. You can research an idea for months before deciding that you can't possibly be wrong. You may think it's the best idea you've ever had. And still, the stock will either go up or down. If you're lucky, it will go up a lot before it goes down... And you'll make money. But even if a stock treats you well for a while, no matter how much you love it, it will never love you back. This is an extremely important idea right now. So today, we'll look at one of our past big winners in our DailyWealth Trader (DWT) newsletter – an idea that was easy to love. And we'll show you why... you need to stick to your stops. We recommended buying shares of National Beverage (FIZZ) on February 3, 2017. The company was growing rapidly. Its flagship brand LaCroix was flying off supermarket shelves. And its founder and CEO Nick Caporella owned (and still owns) a huge 74% stake in the company. DWT readers who followed our advice on National Beverage saw profits from day one. The company's sales and earnings were spectacular. And gains hit the 100% mark by mid-July... just five months after our recommendation. Again, it's easy to "fall in love" with a position that makes you a lot of money quickly. Well... Not long after that, the stock turned lower. We didn't want to sell such a big winner. But it triggered our stop loss – the price level at which we had planned to get out of our investment. So we told subscribers to sell their shares for a 91% gain. If you had bought at our recommendation and were still holding National Beverage today, you'd be up 73% instead of 91%. And instead of booking the bigger gain in about eight months, you would be wondering what to do after 15 months. 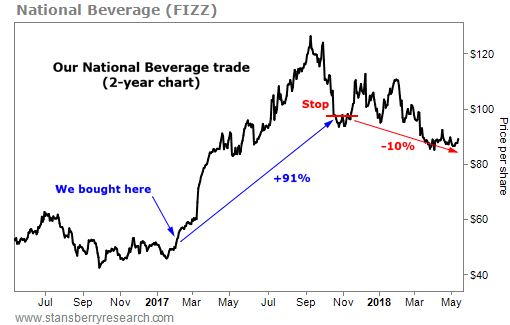 Where will National Beverage go from here? We're not concerned with that. We're out. We've moved on. And we're happy we did. In DWT, we've said all year that investors should expect volatility. The market could go higher from here. It could go lower. Or it could first do one, then the other. We just can't know... especially in the short term. But they don't love us. So make sure you benefit from the good times you've had... And stick to your stop losses. Editor's note: Ben and Drew recently shared a stock that could be setting up for an extreme "short squeeze." If a rally breaks out, shares could soar more than 60%... And explosive triple-digit gains are possible, based on history. To learn how to access this recommendation with a subscription to DailyWealth Trader, click here. "My advice is to prepare for both – rising overall stock prices AND volatility," Ben wrote back in February. Check out his tips for trading this kind of market environment right here: The Return of Volatility. "A successful trade is made up of two parts – a smart entry and a smart exit," Steve says. Learn how using a simple trailing stop can help you lock in gains right here: This Secret Turned a 'No Gain' Stock Into a Triple-Digit Winner. 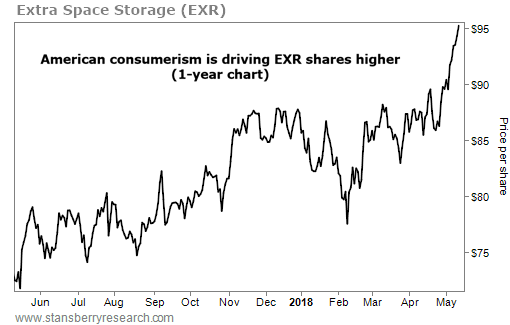 Extra Space Storage (EXR) has become the second-largest provider of self-storage units in the country. It has 1,400 locations, comprising 103 million square feet of rentable space. And business is booming… The company’s first-quarter net income increased more than 9% from the same period last year. And same-store revenue increased more than 5%. The trend is up for the company’s stock, as well… Shares have climbed about 30% over the past year, recently hitting a fresh 52-week high. As long as Americans are buying, moving, and hoarding possessions, big players in the self-storage space should continue to do well.